Heathrow Airport is a major international airport in London, United Kingdom. 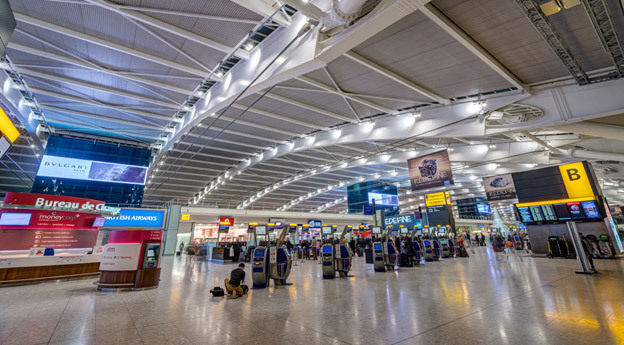 Heathrow is the second busiest airport in the world by international passenger traffic, as well as the busiest airport in Europe. Along with Gatwick, Stansted, Luton, South end and London City, Heathrow is one of six airports with scheduled services serving the London area, although only Heathrow and London City is within Greater London. ATA (Airport To Airport) offers a high quality taxi transfer from Heathrow to Gatwick with affordable rates for everyone travelling. With years of professionalism and expertise in improving our services, once your Heathrow to Gatwick transfer is booked with us, rest assured you will be travelling in safe hands with comfort and style. London Heathrow Airport is one of the busiest airports in Europe, serving 82 airlines and operating from some 180 destinations globally. For your Heathrow Airport pickup, our drivers will enter the terminal to meet you with a sign at the time of your request. For instance, you can request a pickup 60 minutes after landing, so even if the flight is delayed, we will be able to monitor it and send our drivers accordingly. This option will allow those travelling from different locations, enough time to clear immigration and luggage reclaim. Also providing transfers to and from Heathrow Airport to all major airports, cruise ports, Hotels and all cities of London and UK Postcodes at a nominal cost. Looking for an airport taxi transfer between Heathrow and Gatwick Airport? With prices starting from only ₤50.00*, there is no need to look any further, as Airport to Airport is an expert in airport transfers, offering a wide range of services to choose from. Take advantage of our great prices which also include all airport services: flight tracking, meet & greet (driver will wait at arrivals with the name board) also our drivers will wait until clear your customs and collect your baggage’s.